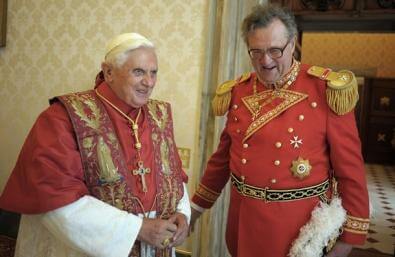 His Most Eminent Highness Fra' Matthew Festing, 79th Prince and Grand Master of the Sovereign Military Order of Malta, (pictured here with Pope Benedict) has kindly agreed to become a Patron of the Oratory's Reaffirmation and Renewal Campaign. "I am delighted to be a Patron of the Reaffirmation and Renewal Campaign. The realisation of Blessed John Henry Newman's vision for an Oratory in Oxford has brought immense blessings not only to the City and the University but to Catholic England as a whole. If these blessings are to continue, the Fathers must have the space to welcome the novices of the future and the means to develop and enhance their distinctive Oratorian missions. I urge you all to support the Campaign."